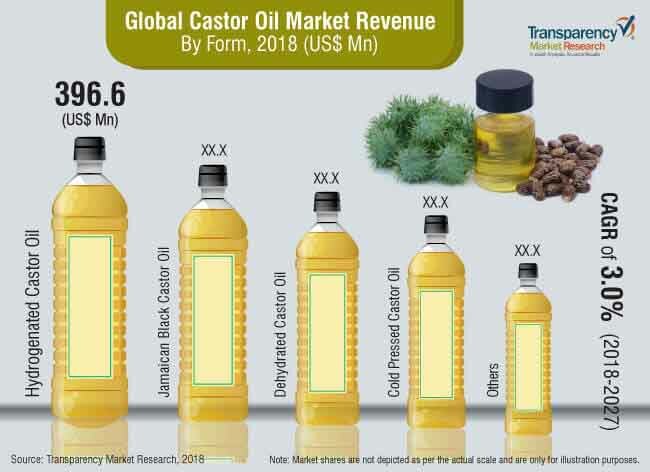 With reference to the latest market forecast report published by Transparency Market Research, titled 'Castor Oil Market: Global Industry Analysis and Opportunity Assessment 2018-2026', revenue generated from the global castor oil market is estimated to be valued at around US$ 1,101.1 Mn in 2018, which is projected to increase at a CAGR of 3.0 % during the forecast period (2018-2027). As castor oil is known for deeply hydrating and nourishing one's hair and scalp, it becomes very difficult for consumers to choose which castor oil is best for them to use. Castor such as Jamaican black castor oil and cold pressed castor oil, among others, offer as antibacterial, antiviral, and antifungal properties, which are all vital for the hair follicles, ensuring better nutrition and blood circulation. With a wide variety of castor oil available in the market, consumers come in a position where they are not able to conclude whether they are purchasing the right product or not. To overcome this situation, consumers are now looking forward to e-Retailers. Online retailers, these days, are offering a wide variety of castor oil to their customers through detailed inventory, which covers global brands and private label products. Moreover, online stores offer castor oil products at very economical prices, along with other rewarding offers or coupons. All these benefits, combined, are predictable to act as positive factors, driving the growth of the global castor oil market over the forecast period. Historically, Brazil’s cosmetic industry has been accelerating twice the speed of its national economy. But due to an economic downturn in 2015-16, the beauty industry also had to face sluggish growth. Now, when Brazil is fully recovering from its economic slowdown, obtaining positive GDP growth in 2017, it is anticipated that the improved economic outlook is likely to have a positive effect on the cosmetic industry of the country, supporting the growth of the castor oil market over the forecast period. Consumers in Brazil have become very sophisticated about their tastes, which is transforming the personal care and cosmetic industry significantly, and making it one of the fastest growing markets on the planet. As a result, castor oil is witnessing increasing demand in the market in Brazil. Due to similar physical properties of petroleum oils, animal fats, and vegetable oils, which can have undesirable effects on the environment, oils and fats are regulated by most governments in the world. As various toxic products can be formed by using castor oil, which can torment the ecosystem, various governments impose regulations on processes involving the production, storage, and transportation of castor seeds and castor oil. Also, labeling requirements for food and procedures for gaining approvals for distribution of the product can prove to be difficult for manufacturers and distributors. Due to the imposition of standards and certification requirements that are difficult to meet, the market growth for castor oil can get hampered in the future. In general, the current rate of castor oil production in North America or Europe is not considered sufficient to cater to the increasing demand. The castor oil market is highly active in nature, as the supply and demand situation keeps on shifting from one hand to another. Castor oil and its derivatives are the key ingredients in the chemical, cosmetic, and personal care industries. Since castor oil is also used to cure sicknesses and stimulate well-being, many consumers from the Western world are demanding these products. However, due to less production of castor oil and absence of international players, consumers have to rely on imported good from countries such as India and Brazil, who produce these products on a very large scale. As of 2016, India alone produced almost around 92% of the world supply of castor oil. TMR has profiled the most prominent companies that are active in the global castor oil market, such as Adani Wilmar Limited, The Chemical Company, Arvalli Castor Derivatives Pvt Ltd., Girnar Industries, Sunny Isle, Sree Rayalaseema Alkalies & Chemical Ltd., Adya Oils & Chemicals Ltd., R.P.K. Agrotech Exports Pvt. Ltd., Cockney Finestyle, LLC, Tongliao Tonghua Castor Chemical Co., Ltd., Purerzan Jamaica, BDI Enterprises, LLC, Thai Castor Oil Industries Company Limited, Jayant Agro-Organics Limited, Gokul Overseas, Itoh Oil Chemicals Co., Ltd., Hokoku Corporation, N K Proteins Pvt Ltd., Shavuot Farms and Amee Castor & Derivatives Ltd. among others. Producers of castor oil are emphasizing on the integration of the value chain downstream to achieve control over the final retail price of castor oil. Manufacturers are focusing on imports to ensure raw material supply in all seasons to cater to consumer demand for castor oil. To gain control over the supply, major suppliers and producers of castor oil are getting into long-term agreements with castor oil seed suppliers. The benefits of this are better-regulated supply, steady price per unit over the year, competitive end pricing, and reduced loss due to processing. Also, most suppliers of castor oil are dedicating a separate storage house to allocate volume of castor seeds for castor oil processing to cater to the demand for castor oil in the market.